I did it! I actually abstained from food for five days. Why in the world did I embark on a five day fast? I am not one to skip or skimp on meals. Until now, fasting ranked somewhere in the neighborhood of doing my taxes and getting my car repaired. 1. The research is substantial on fasting for health, especially for chronic conditions. 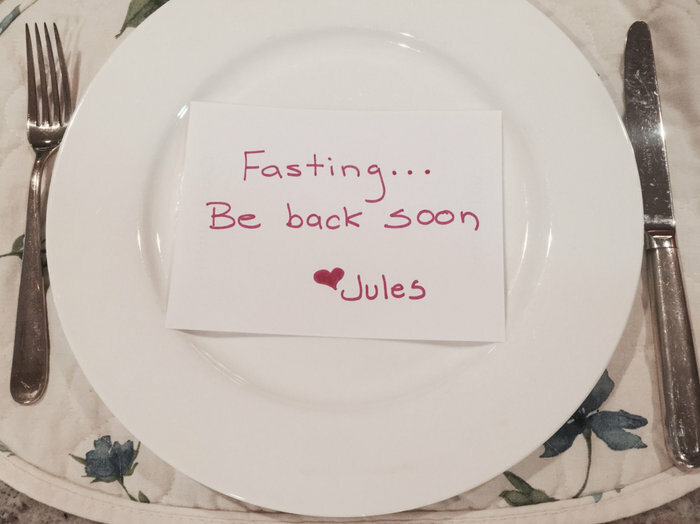 Fasting really gives your digestive system a break, it allows for autophagy to occur at a high rate, puts you in a state of ketosis and fat burning, and so much more. It’s essentially an immune reboot. Some do it for cancer treatments and there's a study out regarding the protective benefits of fasting for patients undergoing chemo. If you are interested in learning more, check out “The Science of Fasting” on Amazon Prime. 2. I am coaching as an intrinsic health coach for a functional medicine program called Biology Basecamp with Dr. Zach Bush and the M Clinic. In this course, Dr. Bush guides clients back to health through many modalities, one of which is fasting. Solidarity prevailed as I jumped into this experience alongside my inspiring clients. Water with lemon in the morning and a bunch of sea salt. ACV also works in lieu of lemon. Continue hydration more than you normally would throughout the day with sea salt (I use pink himalayan or celtic up to 1/2 ts or more). Herbal teas allowed, but I found the only one that really felt good to me was fresh ginger slices steeped in hot water with sea salt. I typically pre-slice my ginger and freeze. Coffee. I skipped it, but if that makes you miserable, keep it in and keep it black. Supplements: I continued to take magnesium, liposomal hemp oil, Restore, and mineral complex supplements. The hemp oil really helped alleviate my menstrual cramps. Prescription meds: I don't take any, but if I did, I would stay on them unless I consulted with my doctor. Day five, I added some bone broth to help alleviate cramping in my leg. I did not take naps, but I did take it easy and was in bed around 9-10 each night. Soft foods like soups for the first 24 hours. I made a sweet potato soup with homemade broth. I also drank some of the liquid from my fermented veggies to reinnoculate my gut with the good bacteria. Two days into the fast, you kill most of that bad bacteria that live on sugars. This is a great opportunity to repopulate your gut intentionally. Chew more and eat less. Practice eating in time restricted windows to continue to give your digestive system more time to clear out. It's very important not to go hog wild the first day you break "fast". You can damage your gut. Coming out of this fast inspired me to stick to real food, increase my veggie intake, diversify my meals, and learn some new recipes. I cleaned myself out and I don't want to put any sludge back in. Baby Steps: Set yourself up for success. Start first with a nutrient dense diet. Next tinker with intermittent fasting or time restricted eating. Sleep: My sleep quality as measured by my Ōura ring varied from super high deep sleep on nights 1 and 2 to not such deep sleep on nights 3 and 4. My HRV or heart rate variability jumped up about 20 points. That is very interesting since I have not been training HRV recently. Hydration: water, minerals, and sea salt are very important. Next time, I’ll load up on some extra minerals and double my water intake from normal days. I had some leg cramping on night 3 and day 4. Bowel Movements: mine stopped after day 1. This is normal. Extra bonus points if you do an enema and clean out completely. Clarity: My brain felt very clear and my awareness soared of how food focused I tend to be. Old voices, like “finish your plate,” “eat a snack before bed,” or “skipping meals will make you tired” can be hard to silence. Symptoms: Some symptomology was cleared up around bloating. Sometimes it’s hard to tell whether my bloat was PMS or poor digestion. I have hacked my digestion for as long as I can remember. This time, I knew it wasn’t food or my intestines complaining. I timed this with my luteal phase dip in the second half of my cycle. It's time to put some effort into my hormone levels. My buddy, progesterone, needs to get in the game. Support: I LOVE my husband of almost 18 years. He supported and encouraged me in so many ways. He cooked all the meals for our children so I did not have to fast and cook food. I posted on facebook each day to keep me honest and was honored to receive abundant messages of support and curiosity from friends. Self-care: I booked three self-care appointments on one of the days. Acupuncture, chiro, and a doctor’s appointment. Next time, I will book a massage and really make a fun day of it. Motivation: I loaded up on fasting videos and podcasts so I could stick to my resolve. Fasting is therapeutic and it tests my discipline. It’s nice to prove to yourself that you can accomplish something like this after a lifetime full of breakfasts, lunches, and dinners. Exercise: The advice I received was to continue your normal exercise or take it down a notch. I took daily walks with my dog and did some functional exercises with a ball and a band. I took this time as an opportunity to just slow myself down. Benefits: My fight or flight response tamped down. One of my triggers is around time. Running late and stuck behind a school bus would normally have me white knuckling the steering wheel. This time, there was no reactivity. I was completely present and content. Weight: I happened to have a doctor’s visit to go over labs from 2 weeks prior. The nurse nervously whispered to me, “Jules, you’ve lost 7 pounds since you were here.” Maybe she thought I was sick. I told her, “please don’t worry, I’m on day 3 of a five day fast.” My weight should return to normal about a week after the fast is complete. I’m proud to have done this. I found one key health diagnosis for my bloating as a result. Now, I can monitor any digestive improvements driven by my five day fast. I felt really incredible on day 1 and 2 after the fast. My skin was clearer, I had more energy, and greater overall resolve toward the care and keeping of myself. Finally, I can talk from experience with my clients who are embarking on this process for themselves.